When you travel to Prague, you actually travel back in time. Beautified with cobblestoned alleyways, neoclassical buildings, hidden courtyards, and medieval squares, Prague is vintage personified, not to forget the history that comes along. Though overly visited by tourists, Prague still echoes with a lot of secrets and here are a few. True to its name, Magical Cavern in Prague is a magical escape into a kingdom you have never seen before. Set in the small hill of Petrin, surrounded by a thick cover of trees is a deserted old mill. Take a step inside and you’ll realize it is not empty. 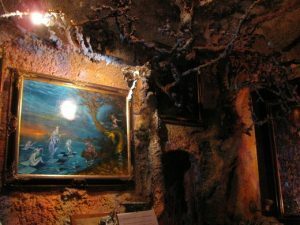 Filled with over 80 psychedelic paintings, the three-storied structure of Magical Cavern is home to the artwork of Prague artist Reon Argondian. Belonging to his own fictional world of Argondia, the paintings are trippy and are a masterpiece. Choose from the alcoholic/non-alcoholic drinks served, relax by the couches, and take in the magic of the paintings. Magical Cavern was opened in 2005 and is one of the lesser known places in Prague. The tickets are priced at: Adults – 70 CZK, students – 50 CZK, and free for children (under 15 years). Just the title might take you to the Harry Potter times. There are multiple sides to Prague and at the Museum of Alchemists and magicians of old Prague, you get to see one such side which you wouldn’t have seen before. During the 16th century, Prague was under Rudolf II, the Holy Roman Emperor who was infamous for his occult practices. Spread over two floors, the gallery is clothed in mystery and carries exhibits from Edward Kelley and John Dee. 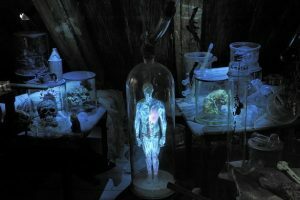 Populated with Alchemist lab, grimoires, scrolls, and homunculus, the museum is a weirdly perfect place to learn more about the dark side of Prague. The ticket is priced at 190 CZK. Originally a part of Prague’s Castle, Deer Moat is a beautiful ravine created by the flow of the stream Brusnice. Thanks to the wonderful location of the tunnel, its existence is relatively unknown to the outside world. Initially, used as a strategical point to defend the castle, the moat was fenced during the time of Rudolf II. It was also during this time, the tunnel was used as a deer hunting ground thereby the name, Deer Moat. 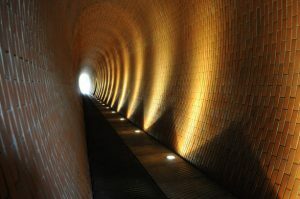 Designed by Josef Pleskot, Deer Moat pedestrian tunnel is one of the best places to go on a stroll if peace is what you are looking for. Prague Castle is one of the top attractions that is visited by tourists but there is one significant thing that most of the people miss seeing in the castle complex. During the 17th century, there was a huge conflict of interest between the Catholics and the Protestants. The then Habsburg Holy Roman Emperor Ferdinand II was determined to announce Catholicism as the only religion. Outraged by the news, the Protestants of Bohemia flung two representatives of Ferdinand out the window of the Royal Palace. And thus began the thirty-year war that lasted from 1618-1648. There were reportedly 5 million to 10 million casualties during the time and the effects still exist. 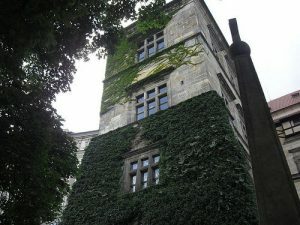 While this was the second defenestration to take place in Prague, the first took place in 1419 when an angry mob threw a Judge out from the New Town Hall. Floating on top of the Prague Museum, Gulliver Airship resembles a Zeppelin crash gone wrong. Take a thousand guess and you will still not be able to figure what Gulliver Airship actually does. Made out of wood and steel, the bright & the airy environment is a reading space. 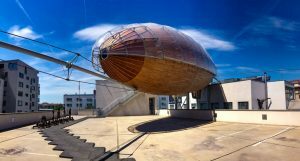 The 140-foot long Gulliver Airship is one-of-a-kind and the increasing amount of sunlight stream passing through the ship makes it an ideal place to sit down with the book you love. The colour and the outlook of the attraction is totally in contrast with that of the Prague Museum which as we learn was intentional. A fusion of modern art and literature, Gulliver Airship is a unique monument that shouldn’t be missed on your visit to Prague. Divoka Sarka is a nature reserve in Prague. Situated in the outskirts of the city, the reserve takes you closer to nature than never before. 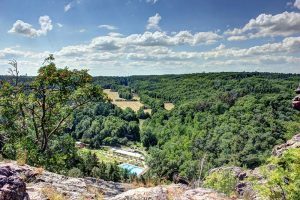 Named after a female warrior Sarka who supposedly threw herself to death from the cliffs, Divoka Sarka is where you’ll find a respite from the buzz of the city. Inside the nature reserve, you will find a lake, Dzban and a public swimming pool which can be accessed upon paying 100 CZK. Divoka Sarka is a great place to hike & cycle. Pack a picnic and soak in the raw wilderness of Prague at your own pace. Imagine an infinite number of books taking over the world? Now head to the Prague Municipal Library and spot the ‘Idiom Installation’. 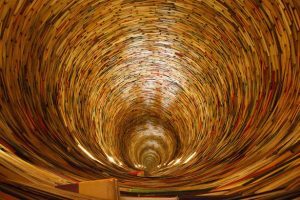 Resembling a Jenga game, the spiralling collection of books stacked one over the other in a cylindrical pattern is an artistic expression of knowledge. Born out of the vision of artist Matej Kren, the Idiom Installation is a literary wormhole where you can lose yourselves. The tower which reaches to the ceiling has two mirrors which are been placed at the top and the bottom giving an illusion of being infinite. This sort of Idiom display was first featured in Sao Paolo International Biennial in 1995. 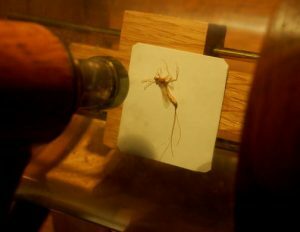 What if you could shrink to the size of an ant and view life from its perspective? Sounds good right. Dedicated to Russian Microminiature sculptor and painter Anatoly Konenko, Museum of Miniatures is a trip into a world which is existent only in the movies. From a three-dimensional Eiffel Tower to a train made of human hair to micro-miniature copies of artwork by Da Vinci, Matisse, Salvador Deli, the varied exhibits will simply make you go wow. The main highlight though is a caravan of camels parading through a needle. And you know what is the most astonishing part, Anatoly Konenko like many other miniaturists can work only between heartbeats as even the slightest of motions can disrupt his creation. You have to pay130 CZK to get inside. 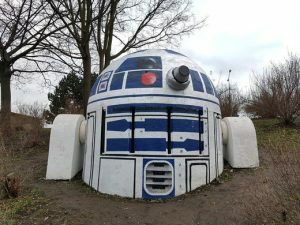 Now, you can meet your favourite Star Wars character while you are at the Folimanka Park in Prague. A group of unknown artists in Prague apparently came together to add colour to an abandoned ventilation shaft attached to a bunker. They not only painted the structure but added two concrete pieces to either side of the dome bringing the beloved droid character to life. Though not an official part of the city, the officials believe it is certainly an improvement from the non-attractive vent. So, there you go guys. Hurry up and strike a pose along R2-D2! Made entirely out of wood, St. Michael’s Church is a compact Orthodox church in the lush expanse of the Kinsky Garden on the Petrin Hill. Centuries old, the charming church sits there peacefully, undisturbed by the outside world and is one of the lovely sights you will ever see in Prague. The church which is enchanting in itself sports three domes with the tallest one standing at 45 feet. Being typically orthodox, the domes are painted in three different colours – red, green, & white symbolizing love, hope, and faith. 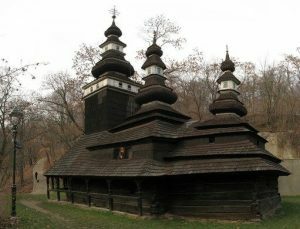 Notably, the church was originally set in a compact village called Ruthenia and has been relocated twice in its lifetime. See all these secrets for yourself the next time you visit Prague. Plan your trip in under 10 mins and go Prague! Christmas markets in Europe, because who doesn’t want some of that Christmas spirit back home!! Czech these out already! – Best things to do in Prague!